Thank you for visiting the History Curriculum page. I hope you enjoy finding out how important History is to us at Northcote and how it is taking place. Mr Hayes and Miss Hartley (Joint History Co-coordinators). History teaching at Northcote Primary School enables pupils to develop an awareness of the past and develop a chronologically secure knowledge and understanding of British, local and world history. 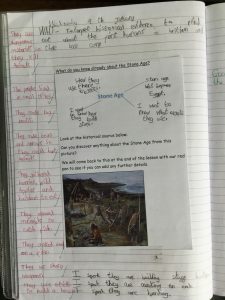 Through quality teaching across each Key Phase, pupils will be able to note connections and contrasts over time and use historical terminology when doing so. With their new found information, children will be prompted to devise historically valid questions considering: changes in time periods; causes of any significant changes; similarities and differences across periods in time and civilisations; and significance of any events in history. When provided with information, children will be encouraged to select and organise it into relevance and importance. Each and every topic taught will be done so with a range of resources, giving children the chance to use their enquiry skills for developing understanding. 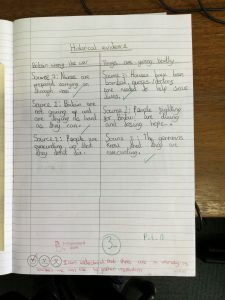 Consider the history whole school plan below to understand how pupils at Northcote Primary School not only receive a depth of studies in the history of Britain and the World, but also leave the our school with a long arc of developed understanding of historical content and enquiry skills. Implementation – History is delivered as part of our ‘Citizens of the world’ Curriculum. History is taught through discrete lessons, where children are imparted with knowledge and understanding of history and its chronology. Children are taught to explore the cause and consequences of events, and their significance in time. 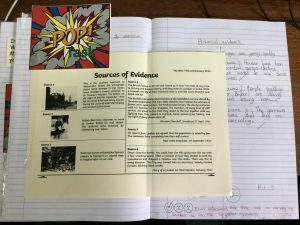 As historians, children are taught the essential skills of being able to use and understand sources of evidence. As the children’s knowledge becomes embedded in their history topics, the subject is used as a vehicle for exploration in other subjects. Art, drama and particularly writing are all linked to the history curriculum enabling children to demonstrate mastery of their understanding. As the children move through the school they begin to learn age appropriate history skills through different history topics. Children are given the opportunities to practice, develop and master these skills as they progress, enabling them to become greater depth historians. 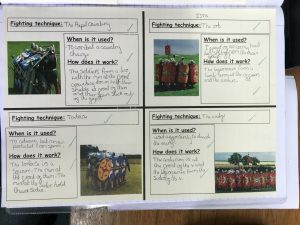 History delivered in mixed ability classes with highly capable teachers using a wealth of resources to consider and the use of skilled questioning to extend knowledge and explore concepts. Teachers have received a variety of training opportunities in how to harness and develop the potential of our young historians. Our school works in collaboration with 6 other local schools; here the subject leaders meet and discuss aspects of the history curriculum, sharing good practice and ideas for purposeful teaching and learning. Every history topic delivered across the school has at least one lesson which is a ‘hook’ to capture the interests and imagination of our children. This may be delivered through a school trip, educational visit or an expert workshop. 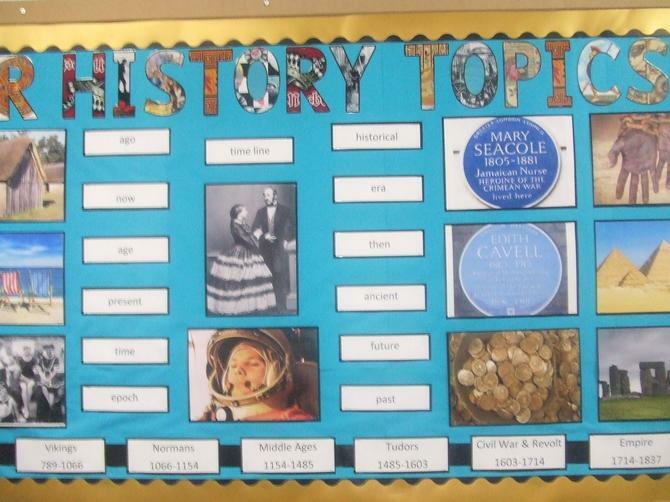 We believe this is the best way to enthuse our children and encourage their passion in their history topic. Impact – At Northcote we use a variety of assessment strands to ensure subject knowledge and skills are consolidated before moving onto the next topic. At the beginning of every topic children are encouraged to self-assess their starting point and consider what they know. Throughout their topic, children will be provided with opportunities to prove their knowledge and skills through targeted Proof of Progress (PoP) tasks. These tasks are differentiated and allow children to show their knowledge. Subject and school leaders monitor the impact of our curriculum provision through completing regular monitoring, that includes listening to the voice of our children. Year 1 have been learning about different toys from the past and present day. They have studied the different materials used to make toys in the past and compared them to materials used to make modern toys. They were lucky enough to visit the Museum of Liverpool and have a special visitor come in to school to show them and talk to them about toys from the past. Year 2 had so much fun learning about the Victorian times. We brought it all to life with a visit to Norton Priory where we learnt all about the Brooke family (a very rich family from the Victorian times!) and had a look around the parts of their mansion that still exist. We also had a very exciting (and a little bit scary Victorian morning in school). We were transported back to the Victorian times right here at Northcote and spent a morning as a Victorian child in school – and yes, the teachers had the cane too! Year 3 – The Stone Age. 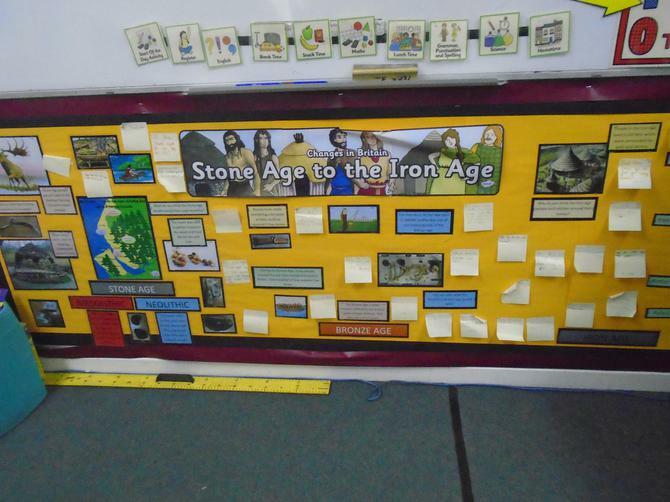 In Year 3 we have be learning about the Stone Age. Below is some extracts of the fantastic learning taking place in year 3. 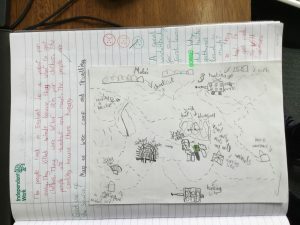 Year 4 – The Romans! 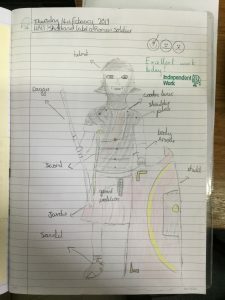 In Year 4 we have been looking at Roman Soldiers and labelling the uniforms. We have studied they different fighting techniques used and identified where they would be used. 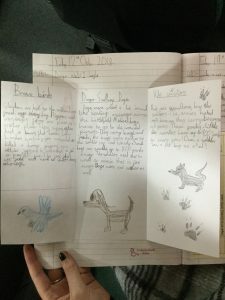 During History Week in year 5, we learned about the importance of animals during WW1 – learning about the different roles of horses, dogs and even birds! 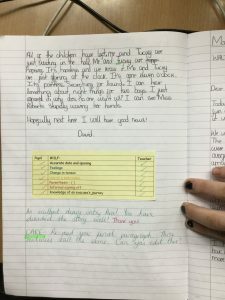 Below is just one of the many fantastic non-chronological reports produced, where the children independently shared their knowledge. In year 6 we have focused on WW2 and the huge significant impact it had upon our local, recent history. 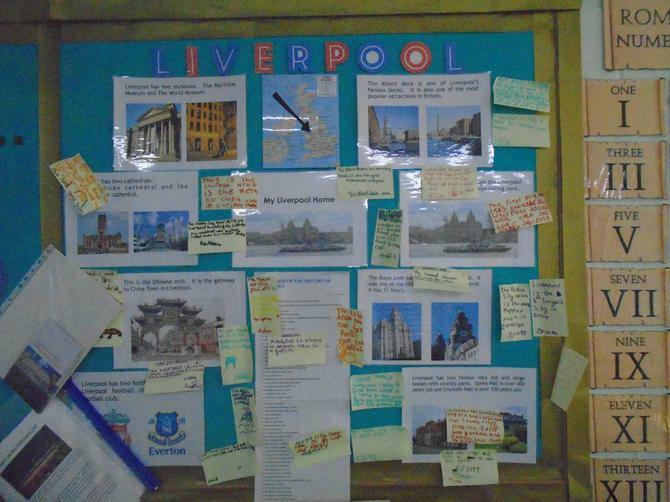 Firstly we considered how the British cities were impacted by ‘The Blitz’, then refined our considerations as to why Liverpool was so heavily targeted with bombs, despite other cities having higher populations. At Northcote, we use Proof of Progress (POP) Tasks to assess if children have an awareness and understanding of the the topics they learn. 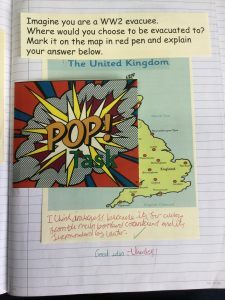 POP tasks are an opportunity for children to demonstrate prior understanding from their learning and apply it independently. Below is an example of a child considering where they would want to live during WW2 and why. 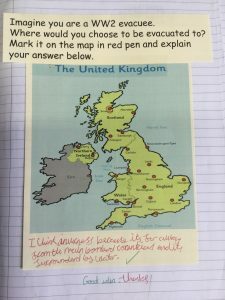 In every History topic, it is important for the children to be ‘history detectives’ – to search for clues that provide them with information about the period of time they are studying. Children are given a variety of sources to consider and shown how to do this expertly by their teachers. When children understand how to use sources, we provide them with opportunities to demonstrate this with POP tasks. 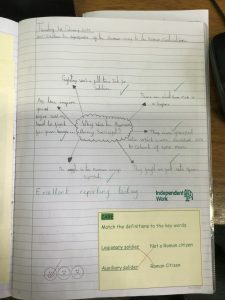 Below is an example of how effectively children in year 6 are able to independently interpret information. 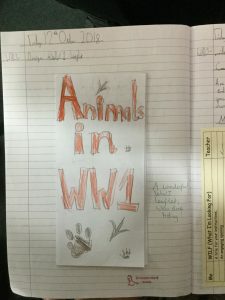 Once our learning from history lessons about WW2 is embedded, we begin to use our subject knowledge from the topic as a vehicle to create fantastic writing opportunities for the children to share their knowledge and prior learning. 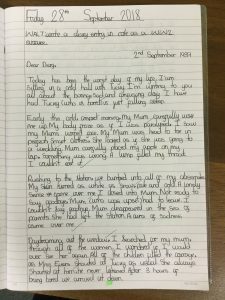 Below is just one example of the fantastic writing our children have produced inspired by their learning from their WW2 history topic. 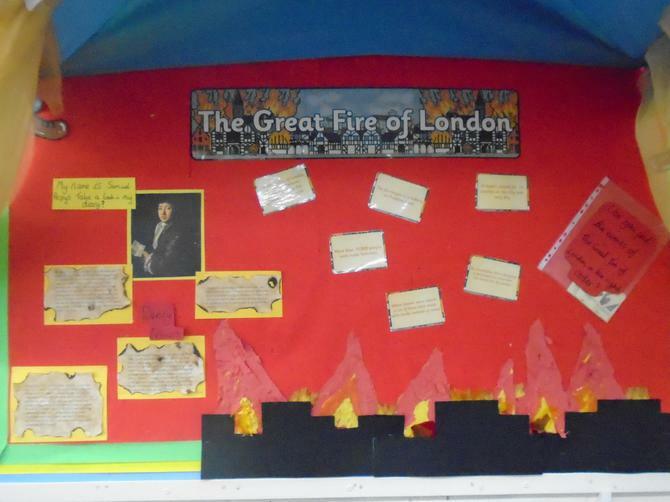 History displays around the school….